Western Whiskey Gazette (WWG): The Deer Hunter. is synonymous with a scant handful of the some of the most desirable western picture whiskies in existence. What surprised me, when I began the research for this article, was the abundance of print concerning not the brands produced by this firm but instead, the amount of publicity E. A. Kolb garnered due to his obsession with deer hunting. His passion for the hunt was legendary, and it's nearly impossible to read an issue of the Pacific Wine and Spirits Review, without coming across an article about Kolb's latest deer hunt. Although most of his hunting activities occurred in the Mendocino hills of central California, I found one reference to his frustration in not being able to hunt his familiar stompin' grounds, due to new seasonal game regulations and instead, made one brief foray into Southern Oregon to slay a "big one" in the early 1890's. Many years ago I was metal detecting just south of the Oregon State line in an area that had been heavily mined for gold just after the turn of the century. We'd done well there in the past having dug good quality, albeit post turn of the century, bottles and artifacts. About a half mile north of the center of the mining activity my detector picked up a strong signal. It was fairly low on the ID scale, which indicated a ferrous target. Sure enough, out popped a solder seam tin can from beneath several inches of forest floor litter. It was quite obviously late 80's - early 90's; much earlier than what we'd been accustomed to digging down at the mine and mill site proper. It had been crudely opened with an implement other than a can opener, and was the type and size that could have held canned peaches or something of the sort. The can was the only target picked up by my Garret, but I scraped around in the mulch in the off chance that there was a bottle in the vicinity. As luck would have it, a large amber shard made its appearance. Embossed on it was a picture of a large buck. It read " Old Joe Tracy / Trade (picture) Mark / Whiskey / Kolb & Denhard / San Francisco". Herman A. Denhard is listed as both living, and working, with his brother John in 1889. They were engaged as butchers and pork packers. E. A. Kolb had married an Emma Denhard in 1888. At the time, he was associated with the firm of Kohler and VanBergen, who were liquor wholesalers. 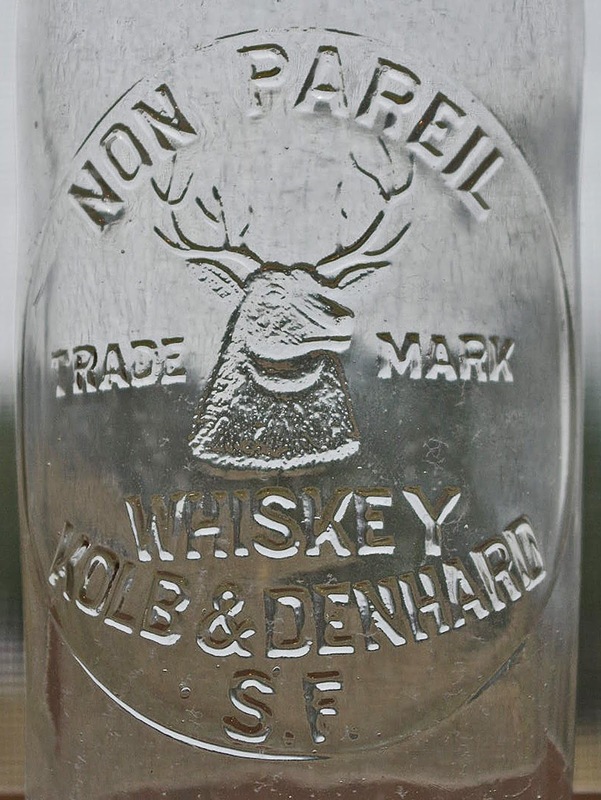 Although I could find no listing of Emma prior to the marriage, there can be no doubt that she was Herman's sister, and that the newfound relationship resulted in the partnership of Kolb and Denhard in the liquor business, which debuted in 1890. They were originally located at 422 Montgomery St. smack dab in the heart of the downtown business district. Initially, they advertised somewhat generically for California and imported wines, brandies and liquors. Shortly thereafter though, they embarked on a campaign in the California Wine and Spirits Review, which ran for nearly ten straight years. This campaign pushed the flagship Non Pareil brand, and pushed it hard. A mold was commissioned and the bottles were blown, filled and marketed. They were a clear cylinder fifth with a base mark of 113. Who actually blew them is unknown but they bear all the hallmarks of a San Francisco bottle. For whatever reason, the vast majority of this brand must have been sold in paper labeled slicks as only two mint to near mint, and one repaired example are documented to exist in collections. Yes, I know, it's "just a clear fifth". But with only three documented examples in any condition existing, it's a darned sight rarer than 99% of any glop top! Another bottle was also produced in the form of a handled jug. It is always crude, red, whittled to beat all, and was most probably produced in Europe, as many of the other "German Connection" fifths were. They too, are exceptionally rare, with somewhere in the neighborhood of a dozen known. Of these, the majority are missing the handles, no doubt the weak point of the vessel. Kolb & Denhard weren't bashful about their pricing structure. After all, if you wanted Non Pareil, you had best be willing to pay for it. 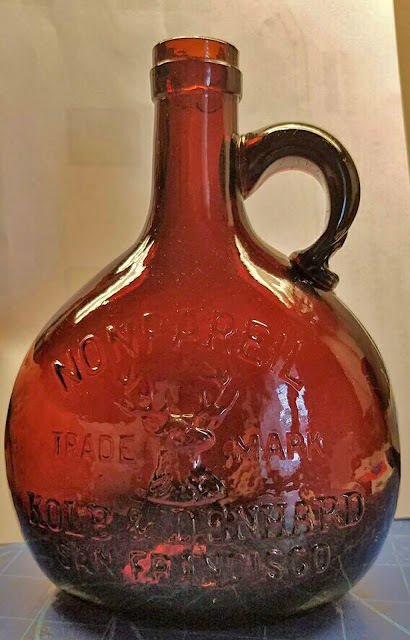 The fifths listed for $2.50~ (this in an era where most decent drinkin' whiskey sold for a buck a bottle) with the presentation jugs listing for a five dollar bill! A quick Post Script; I was reminded by an old friend that there is one other bottle that Kolb & Denhard had produced for the brand. It is a pint pumpkinseed blown in clear glass. One intact example is known to exist. It was found in the vicinity of Roseville California around 1972. To date, no other whole specimens had been reported. 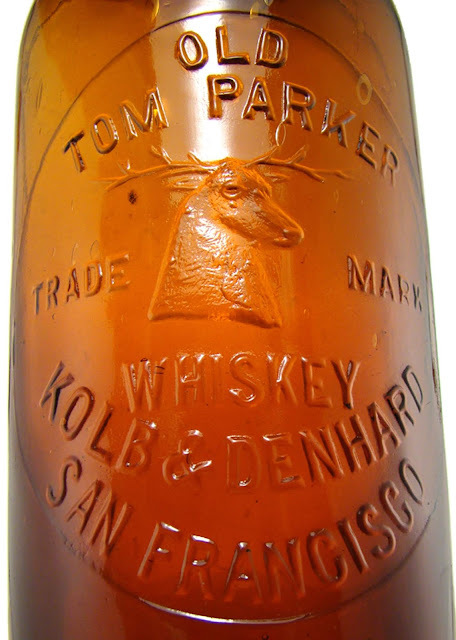 Somewhere along the way, they opted to introduce two more brands; Old Joe Tracy, and Old Tom Parker; best guess is in that order. Old Joe Tracy must have flopped, hard, as no known intact bottles exist. At one time, there was one in a collection, but sadly it was accidentally broken. Both the Joe Tracy and the Tom Parker (Kolb & Denhard variants) are amber with tooled tops, and are highly sought after by collectors today. One was embossed "Old Joe Tracy / Trade (picture) Mark / Whiskey / Kolb & Denhard / San Francisco", the other "Old Tom Parker / Trade (picture) Mark / Whiskey / Kolb & Denhard / San Francisco". Kolb & Denhard are listed in the SF Directories from 1890 - 1902. Denhard left the firm in June of 1902. A new firm, E. A. Kolb Co. Inc. was incorporated on July 3. 1902, registration #35787, with a capitalized worth of $25,000~. 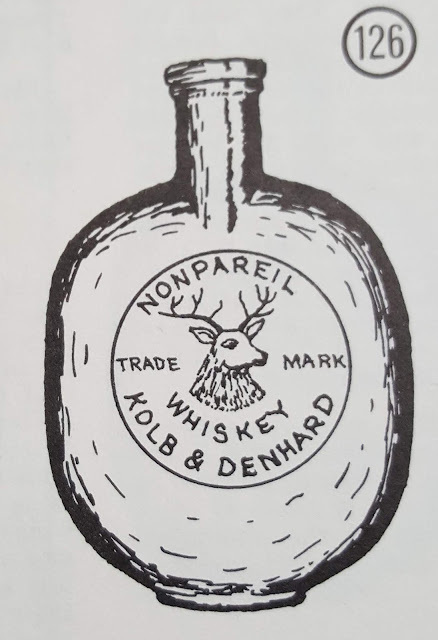 Although Herman Denhard is still listed as living in the city in the 1903 SF directory, all reference to his association with Kolb, or involvement in the wholesale liquor trade, disappears. A new mold was commissioned (not just a re-slugged modification to the original) for the new firm. 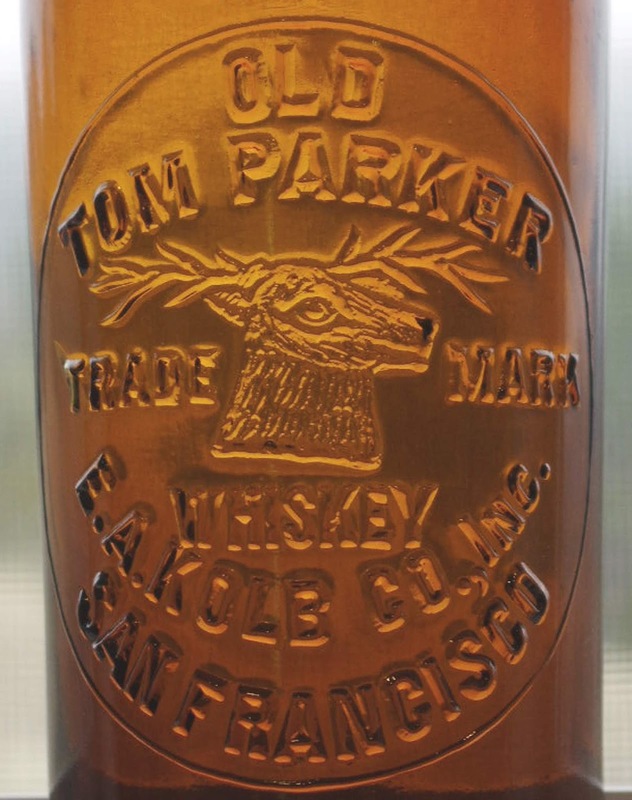 It is embossed "Old Tom Parker / Trade (picture) Mark / Whiskey / E. A. Kolb Co. Inc. / San Francisco". Whether through fortuitous fortune or dumb luck, E. A. Kolb made the decision to sell out prior to the end of 1904. The lucky (or in this case unlucky) buyer was the Golden Eagle Distilleries Co. They set up shop at 417 - 419 Montgomery St., directly across the street from Kolb & Denhards old digs. The transition must have been smooth and amicable as E. A. Kolb maintained an office at the 417 location for one more year, forever vacating the address in late 1905, slightly in advance of the April 18, 1906 disaster which consumed the entire area later that fateful morning. Coming full circle, we have E. A. Kolbs passion for bagging the big one for the existence of some of the rarest and most desirable of the western picture whiskies. Thanks Tom! I totally forgot about the existence of the seed. I've updated the article to reflect the line drawing of it which appeared in the Thomas Picnics, Coffins, Shoo-Flies text. Again, thanks for the reminder!